On an unusually hot day in late September, I met up with the gorgeous Nesha Torres down in Ocean Beach for a quick yet totally killer shoot! Nesha works closely with Shop Trendy and Tipsy, a San Diego boutique whose pieces I not only love but use in my shoots frequently, so we figured it was about time we got out and worked together! The pieces were styled by Katie, the owner of Trendy and Tipsy, and the laid back vibe worked perfectly on the sweltering day! The first look we played with was a pair of perfectly destructed boyfriend jeans and a cute lacy white bralette topped of with a great pair of white rimmed shades. I am so in love with the jeans and need to get myself a pair just like them. ASAP. After shooting the first look down by the OB pier, we were in desperate need of some shelter from the sun. We wandered back behind one of the many bars in the OB area and found this stack of Modelo keg's and I knew we had found our next shoot location. 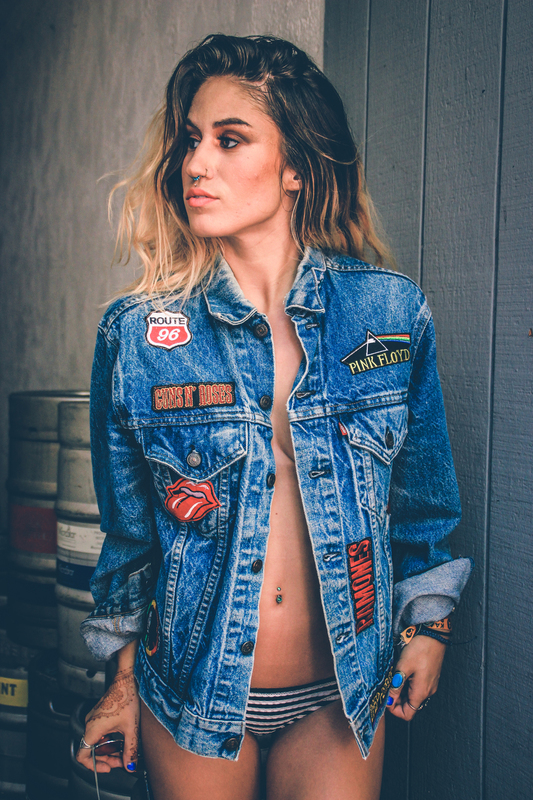 This look features one of Trendy and Tipsy's signature denim jackets featuring a vintage wash and some great rock and roll patches and a pair of Volcom bikini bottoms. Nesha really brought the fire in this look and I captured some of my favorite images of this series back in the little hidden nook. Since it was such a warm day, Nesha wanted to incorporate some ice cream into the shoot as well, and heck who can say no to ice cream?!? We used the Volcom bottom again and topped the look with a vintage Robert Plant tee to create a laid back beach vibe. I love the way these shots with the ice cream came out, so late summer in SoCal! Eventhough this shoot only took us about 45 minutes to to knock out, I loved every second of it! Nesha and I have another shoot in the works so be sure to watch for another set featuring this babe coming soon! Also, if you are in the San Diego area, everyone needs to go and check out the grand opening of the Trendy and Tipsy retail store, opening down in PB on Sat Nov. 14th! Just follow the link to their website for more info/exact location! Thank you to everyone involved in this great shoot, and be sure to check back here soon for my next post, featuring one of my newest (and most favorite) editorials, Shipwrecked, published in Stone Free Magazine! !